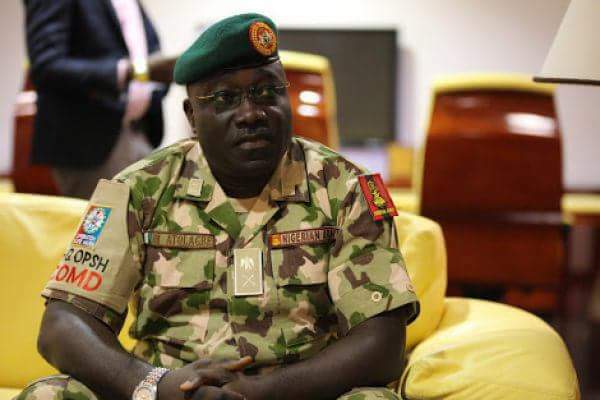 The replacement of Maj. General Anthony Atolagbe with Maj. Gen. Chukwudi Agundu as the Special Task Force Commander in Plateau State may have been triggered by his persistent resolve to ensure justice and stamp out violent attacks on Plateau communities. Gen. Atolagbe's trials began when he moved the STF Operational headquarters to Barkin Ladi town, the headquarters of Barkin Ladi Local Government Area where suspected herdsmen attacks have concentrated in the recent past. His decision to relocate came shortly after the killing of over 200 in Barkin Ladi and two other LGAs by armed herdsmen. He had facilitated the arrest of two Fulani herdsmen and 15 native youths over the attacks and subsequent reprisals in the Plateau State capital. On the day he relocated the STF, he paraded 11 more attack suspects who were later said to be making daring confessions to Police in the Nigerian capital, Abuja. A Presidency source had reported that the suspects' confessions had indicted many top politicians in the nation's northern region. As such, the former United Nations Peace keeping troupe Commander, Gen. Atolagbe was perceived to be a threat to the political class who are believed to have an interest in the Plateau attacks. Consequently, the plots for his removal began as reported early July by this medium. Gen. Atolagbe had in addition to the earlier arrests moved funds to facilitate the purchase of operational motorcycles for his Special Forces to enable them navigate difficult terrains and effectively solve crimes. This followed the State Governor, Simon Lalong's alleged refusal to grant the STF's request for such provisions. He had equally commenced the compilation of records of destructions by herdsmen on natives' farms among others for onward mobilization of compensation. This was after he declined a bribe of 100 cows from some interest parties to relax his security architecture in favour of certain parties in the conflicts. Gen. Atolagbe's sins came to a climax after he paraded seven more herdsmen attack suspects, among whom was the Chief Armourer of the herdsmen, in Lugere, a Fulani seized native community located near recently attacked Marabar Kantoma village near the Plateau State NYSC Secretariat, Mangu. The suspects are equally said to be making more daring confessions, revealing the sources of their arms and finances. On the day of the parade, very unlike the STF, it was the Acting Defense Information Director, Brig. John Agim that addressed newsmen as against the popular tradition of having suspects paraded by local authorities. The idea according to sources was to have the suspects moved to Abuja for possible manipulation of evidences and subsequent release. Although a vehicle was brought to the STF headquarters wherein the suspects were moved to an unknown location, believed to the Abuja, the STF Commander, Gen. Atolagbe was said to be opposed to the idea. Sources say Gen. Atolagbe insisted that the crimes were committed in Plateau state, as such, their trial must be done in the state. This was believed to have further severed relationships between him and some superior powers in the nation's seat of power, Abuja. The powers are not yet known but Gov. Simon Lalong of the state has severally said he knew some of the attackers and that he had been having meetings with herdsmen in the state towards peace building. Lalong has equally been said to have paid huge sums of money to herdsmen as compensation to prevent attacks. This may have necessitated Gen. Atolagbe's compilation of destructions done to farms, in view of his believe that all citizens must be treated equally and fairly. Atolagbe had shortly before opposing the movement of the arrested suspects flouted orders to carry out a violent raid on Fan community in respect of alleged cattle rustling. The Army General according to sources had insisted on hunting only armed rustlers instead of victimizing entire communities. Sources had said the Governor might be one of those working to cover up crimes by withholding support for the STF Commander. He has however publicly stated his resolve to restore peace in the state, though he has never visited any of the attacked communities in recent years. He has equally attempted blaming the attacks on political conspiracy from the opposition while insisting ranches were a solution. Despite that, a primary school in his local government, Shendam was recently attacked by suspected herdsmen, bringing to question the mutuality in his supposed relationship with the herders community.